This Blueberry Acai Protein Smoothie Bowl is a healthy way to start your day with fresh fruit and lots of powerful antioxidants like blueberries and acai. It can be made in a matter of minutes with a Vitamix or other blender and you can customize the toppings to your favorite fruits or whatever you have on hand. I really like using the Sambazon frozen smoothie packs because they have 0 grams of sugar and are a good source of healthy omega 3, omega 6 and omega 9 fats. 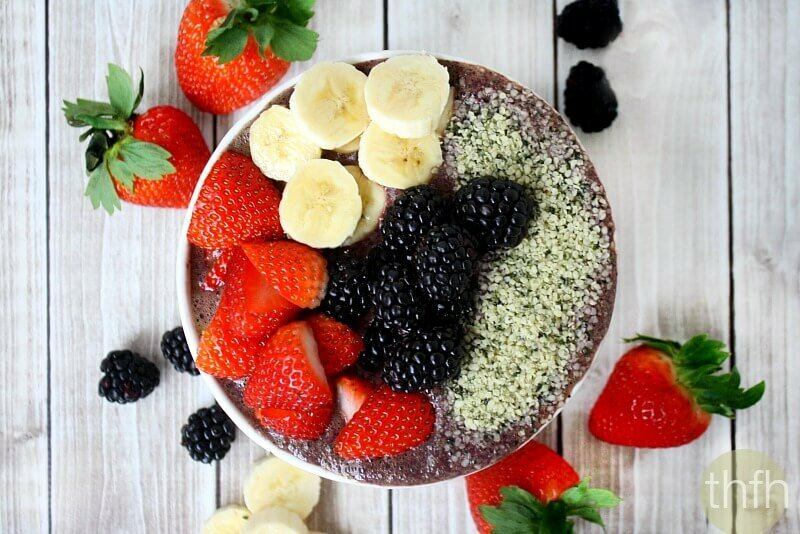 You can find them in the frozen food section at Whole Foods but if you don’t have access to a Whole Foods you could also try using the acai powder to get the benefits of the acai berry. Want more recipes using the acai berry superfood? Check out Classic Acai Bowl, Acai Berry and Banana Mini Cheesecakes, Acai Berry and Banana Immunity Smoothie or my Clean Eating eCookbook with an entire chapter of 20 healthy, clean eating smoothie recipes you will love! 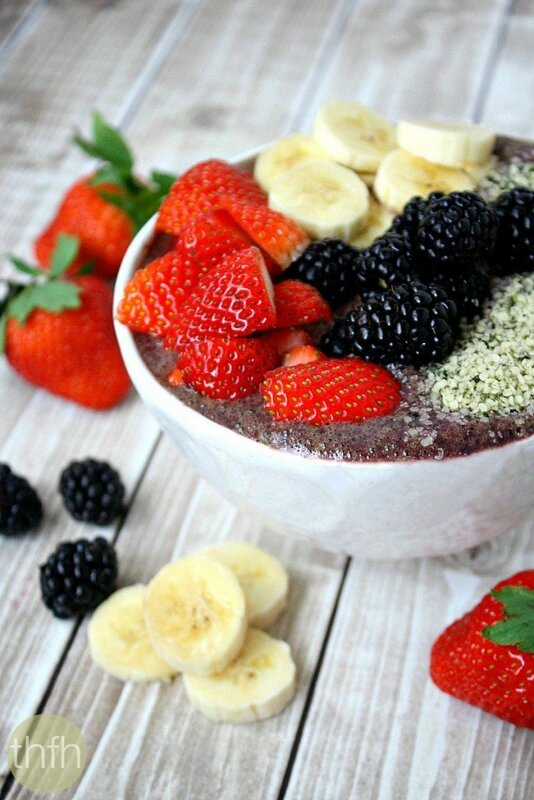 Tip #1: I used fresh, organic bananas, strawberries, blackberries and hemp seeds to add on top of my smoothie bowl, but feel free to use your favorite fruit or berries or whatever you have on hand. Tip #2: My favorite raw/vegan plant-based protein powder is Epic Plant-Based Protein (Vanilla Lucuma), but feel free to use your favorite brand (5 tablespoon). Step 1 Add all ingredients to a Vitamix or blender and blend until creamy and smooth. Pour into a bowl and top with your favorite fruit or berries. The recipe and photographs for "Blueberry Acai Protein Smoothie Bowl" by Karielyn Tillman of The Healthy Family and Home are licensed under a Creative Commons Attribution-NonCommercial 4.0 International Licenseand cannot be used without my written permission. I’ve seen pictures of acai bowls but I’ve never made one before. This looks delicious!